HALIFAX, Nova Scotia — The United States extended its record unbeaten run against Canada to nine rugby tests by winning 42-17 on Saturday. Thanks to a superior pack, U.S. flyhalf AJ MacGinty dictated proceedings after they endured a rugged opening quarter from the home side. A chip and scoop by MacGinty set up No. 8 Cam Dolan for the first try, and his cut-out pass sent in left wing Nate Augspurger for their second. 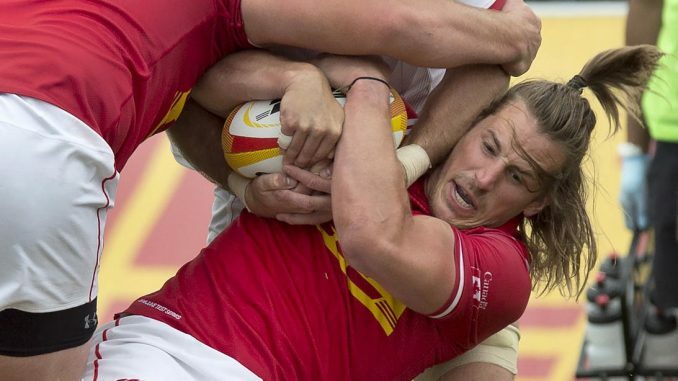 Canada threatened right on halftime but lost the ball on the try-line and trailed 13-3. Augspurger turned provider for Dolan’s second try, and Canada replied by sending flanker Evan Olmstead over in a rolling maul to trail by 10 and still be a threat. But that evaporated with about 10 minutes to go when Eagles replacement flanker Vili Toluta’u, on debut, was held up, and Dolan used the following scrum to power over for his hat-trick try. The match finished with three more tries, two by the U.S.
Canada has traditionally dominated the rivalry, but the U.S. hasn’t lost to its neighbor in four years, and hasn’t lost its last five matches in Canada. The Americans also completed their June series undefeated, with other wins over Scotland and Russia. The same teams crushed Canada this month.